complementary RNA (cRNA) viral RNA that is transcribed from negative-sense RNA and serves as a template for protein synthesis. heterogeneous nuclear RNA (hnRNA) a diverse group of long primary transcripts formed in the eukaryotic nucleus, many of which will be processed to mRNA molecules by splicing. messenger RNA (mRNA) RNA molecules, usually 400 to 10,000 bases long, that serve as templates for protein synthesis (translation). negative-sense RNA viral RNA with a base sequence complementary to that of mRNA; during replication it serves as a template for the transcription of viral complementary RNA. positive-sense RNA viral RNA with the same base sequence as mRNA; during replication it functions as mRNA, serving as a template for protein synthesis. ribosomal RNA (rRNA) that which together with proteins forms the ribosomes, playing a structural role and also a role in ribosomal binding of mRNA and tRNAs. small nuclear RNA (snRNA) a class of eukaryotic small RNA molecules found in the nucleus, usually as ribonucleoproteins, and apparently involved in processing heterogeneous nuclear RNA. transfer RNA (tRNA) 20 or more varieties of small RNA molecules functioning in translation; each variety carries a specific amino acid to a site specified by an RNA codon, binding to amino acid, ribosome, and to the codon via an anticodon region. Schematic diagram of features common to transfer RNA molecules, depicting the anticodon and amino acid attachment regions. Dotted lines between chains represent hydrogen-bonded base pairs. The characteristic cloverleaf is formed by the hairpin and loop structures that result from intrachain hydrogen bonding. 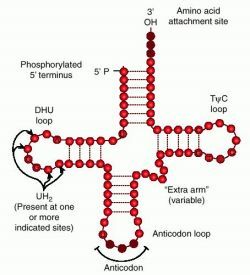 Ribonucleic acid Molecular biology A polymer of ribonucleic acids that functions in coding, storage, transfer and translation of genetic information. See Antisense RNA, Catalytic RNA, Chromosomal RNA, Heterogenous nuclear RNA, Pre-mRNA, Ribosomal RNA, Transfer RNA. Abbrev. for ribonucleic acid. This molecule, in common with DNA and MITOCHONDRIAL DNA, carries coded instructions for the synthesis of specific proteins from AMINO ACIDS. RNA may be a double chain like DNA but in the cell usually exists as a single polynucleotide chain, like one strand of the double helix of DNA. Whereas in most cells DNA carries the permanent, inheritable code for cell reproduction, RNA most commonly acts as a transcriber or as MESSENGER RNA (mRNA) carrying the code elsewhere, as to the RIBOSOMES in cells where proteins are actually formed. In some viruses, however, the inherited code for replication occurs in the form of RNA. Transfer RNA (tRNA) picks up and carries amino acids to the ribosomes to be inserted in the correct sequence of the protein. Ribosomes contain ribosomal RNA (rRNA) and proteins.RNA can take up complex three-dimensional configurations an can act as an enzyme with itself as substrate. It seems likely that RNA preceded DNA in evolution. (c) TRANSFER RNA which acts as an ‘adaptor’ molecule and carries amino acids to the ribosomes to be inserted in the correct sequence during translation. RNA is also found in some viruses as the primary genetic material. Other types of RNA have regulatory roles; see, for example, ANTISENSE RNA; or processing roles, for example snRNA. the functional inactivation of specific genes by experimental introduction of a corresponding double stranded RNA, which induces degradation of the complementary single-stranded mRNA encoded by the gene but not that of mRNAs with different sequences. See microRNA and gene silencing. small RNAs containing 21 to 33 nucleotides that associated with multiple proteins in a RNA-induced silencing complex (RISC) that repress transcription of specific target mRNA by hybridizing to its 3' untranslated region. a sequence of about 10 nucleotides long copied from DNA by RNA primase and required for the priming of the synthesis of each Okazaki fragment during DNA replication. folding of single-stranded RNA molecules which arises from intramolecular base pairing. small (7S; 129 nucleotides) RNA molecules found in the cytosol and rough endoplasmic reticulum associated with proteins that are involved in specific selection and transport of other proteins. a general term for many diferent kinds of small RNA molecules found in the nucleus of a cell that include as examples species involved in splicing of introns from mRNA and in RNA interference. viruses distinguished by having a ribonucleic acid genome, usually as a single strand which may be positive or negative sense, a single molecule or a segmented; in at least two families the genome is a double-strand segmented form. As it happens, the nucleus contains RNA molecules also. Pack Creek RNA in Alaska's Tongass Natural Forest covers nearly 6,000 acres and offers protection for brown bear along meandering salmon streams. says, "If you understand the structure and the mechanism of how RNA polymerase works, it will help yon understand gene regulation," which in turn is "hugely important" to studies of disease. Aryl hydrocarbon receptor gene silencing with small inhibitory RNA differentially modulates Ah-responsiveness in MCF-7 and HepG2 cancer cells. The aqueous phase was then separated by addition of 1-bromo-3-chloropropane (1:10 by volume), and RNA was precipitated from the aqueous phase by addition of ammonium acetate and isopropanol (final concentrations, 0. A second reason is an extension of this, in which we consider that RNA is a marker for not just gene (and thus organism) presence but more specifically for its biological activity as evidenced by ongoing gene expression. Since then we've all been wondering how RNA replication could have started on the primitive Earth," Joyce said. We aimed to design a simple, fast, and cost-effective method for complete RNA extraction that utilized the least amount of pancreatic tissue. In order to rule out the virus, the researchers analyzed skin cells from the same people and found that RNA misspellings originally discovered in the white blood cells were also in the skin cells. Although messenger RNA (mRNA) is generated in order to be translated into protein, numerous classes of "noncoding" RNAs also exist; these complex molecules all share the property of being nontranslatable. We developed a system for rapid determination of viral RNA sequences whereby genomic sequence is obtained from cultured virus isolates without subcloning into plasmid vectors.